A graphical image of the Project 21630 Buyan Class corvette. A side view of the Astrakhan, the lead corvette in the Project 21630 Buyan Class. 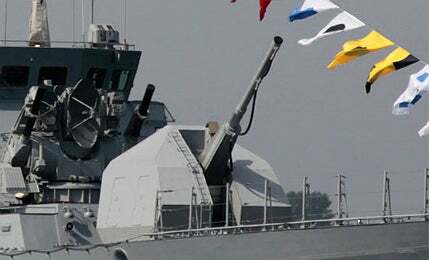 The bow deck of Buyan Class corvette is mounted with a single A-190 100mm cannon. "Project 21631 (Buyan-M) corvettes, the missile variants of Project 21630, are being constructed at the Zelenodolsk shipyard." "The keel for the first corvette in class, Astrakhan, was laid down in February 2005 at Almaz Shipyard in St. Petersburg."